Only someone with a severe mental impairment could not realize that when Ted Nugent, the right wing's leading intellectual, called President Obama a "subhuman mongrel," he was reverting to Ku Klux Klan racism. He later apologized for his particular words, but doubled-down on reasserting all the old racial stereotypes about black people that the KKK held so dear and many, many people still do. Like many people, I made the fatuous assumption that the election of a black president meant that the nation had finally matured out of its racial and class bigotry and that such factors no longer shaped the character of the country. Ted Nugent, many GOP leaders in Congress, and numerous people on the Internet, in saloons, and in church sanctuaries proved us all wrong. The election of Barack Obama inspired a resurgence of racism, and with the likes of Nugent, it is there to stand as part of the American legacy. The service that Nugent and his kind perform is to disabuse us of the notion that the nation leads the world within matters of equality, freedom, and justice. Jim Crow has us by the short ones. If Congress had any, it would have them by the cajones. But they have demonstrated to those of us who struggled with civil rights that the struggle is far from over, and we need to renew our resolve, recognize that some of our neighbors are enemies, and deal with them more realistically. Broussard has all kinds of problems with the law itself — that it's wrong to force people to buy insurance, that it will make businesses hire less. But there's something else that bothers him: The law is the signature achievement of a man Broussard never wanted to see become president. "I don't vote for black people, lady," he says. "No, ma'am. I don't vote for black people. They got their place, I got my place. That's the way I was raised." The right wing has taken to equating its hatred, its lust for discrimination, exclusion, and defamation with patriotism and Christianity. The latest ploy is to exercise bigotry and hatred as part of their religious faith, which they claim the right to do. There are people who define themselves by who they hate and wish to exclude from any claims to liberty. Madville Times took on a South Dakota blogger who insists that the exercise of his KKK hatred is a matter of religious devotion and Constitutional right. These are the latest examples of American exceptionalism. They list those people they would like to except from civil rights and human dignity. But what is most galling is those among us who insist that the we live in the land of freedom and tolerance, while so many people are conniving ways to destroy any movement toward freedom, equality, and justice for all. 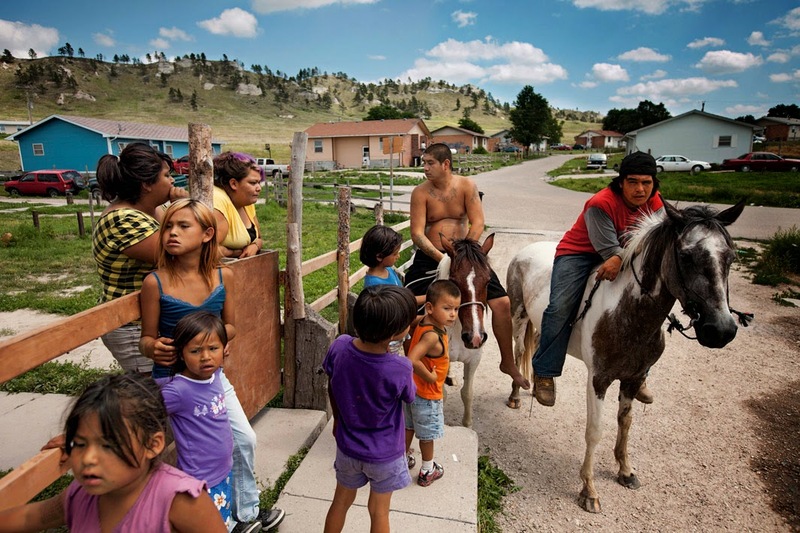 Slate reviews photographer Aaron Huey's book Mitakuye Oyasin on Pine Ridge. It is a powerful antidote to the often bipartisan racism that afflicts South Dakota. It is carried by Joop Bollen who as director of the South Dakota Regional Center is a major figure in the disaster of Northern Beef Packers, EB-5 loans, and the alleged suicide of Richard Bender. As a state employee and then a contractor for the Governor's Office of Economic Development, Bollen obtained and administered the EB-5 loans which lost millions of dollars for foreign investors. Joop Bollen who owns various properties in Aberdeen, including the Fifth Avenue Apartments, said he is concerned with the validity of the study. “I’m very concerned that the study is skewed,” Bollen said questioning whether the study takes into account recently constructed apartments in Aberdeen and the recent closure of the beef plant. In addition to concerns about the study, Bollen also questioned whether it’s the city’s role to subsidize public housing. The mayor pointed out that Aberdeen has been involved in public housing for 50 years. The private landlords have enjoyed a landlords' market in Aberdeen for years. With the addition of hundreds of units in recent years to provide housing for an expected influx of workers, spearheaded by the opening of the failed beef packing plant, developers have erected a number of apartment units throughout town. There is a disparity between what the units cost and what workers make in Aberdeen. A perennial problem in Aberdeen has been the quality and price of rental housing. During my years at NSU, students complained constantly about off-campus housing. Much of it was in converted residences and were tacky to the point of being shanty towns. When I first came to NSU, students had put together a program which listed approved rental units available to students. The units were inspected according to a checklist and, if they met the standards, were listed for student convenience. The originators of the program had long graduated, and it was getting difficult to find student association members who would go out and conduct the inspections, so an assistant manager in the student services department was asked to recruit, train, and coordinate inspectors. After some months of accompanying students on inspection tours, he reported at a meeting that he found many housing units that did not meet the standards and that were overpriced. The administration decided that the program served no useful purpose if there was such a limited number of units that the university could approve, and it ended the service and decided to concentrate on upgrading resident student housing. The matter was brought up to Democratic Party members, and we had a study committee to investigate just what the complaints were about housing. The first aspect was that the housing was, indeed, overpriced for what was available. We broadened our focus from student housing to include young working people, who complained just as much. We found what has been repeated and denied consistently over the years. While it is a South Dakota myth that the cost of living is cheaper in the state and justifies lower wages, we found that young people simply were not paid enough to cover their housing, utilities, food, transportation, and other necessities. Rent was a big chunk of their expenses, and many of the rental units were dreadful--rundown, makeshift, and downright depressing to be in. Many students, especially single parents, found help in subsidized housing, which made it affordable for them to attend college. The real complaint that some landlords have about subsidized housing is that they may have to lower their rents to compete. City housing makes it possible for many people to live decently, something that is of no concern to the private rental market. The study shows that there is a 3.9 percent vacancy rate in Aberdeen. The private landlords want to be subsidized by eliminating the competition provided by the city. Bill in South Dakota legislature to change title from governor to capo. The state legislature has voted down any measures that could provide a comprehensive view of the nature of state government's role in economic development, the way government and private businesses and organizations intersect, and the degree of influence and control that business interests exercise over state government. After the bankruptcy of Northern Beef Packers and the subsequent revelations of the state's efforts at economic development and the handling of EB-5 loans along with state money, an abundecance of evidence that indicates conspiratorial corruption exists, but the forces in place carefully word their findings and conclusions to evade any serious confrontation with malfeasance and misfeasance and they make any insidious findings sound like minor accounting errors. Every statute which purports to require public access to information is laden with exceptireons and loop holes that effectually nullify the access by giving state officials the discretion and power to determine what is released. An absence of laws requiring the keeping of full records of the proceedings of government agencies. Where there are no records, there is no information for which government agencies and officials can be called into account. However, we considered responsibilities the SDRC, Inc. had to individual EB-5 investors, contractors, related limited partnerships and the projects receiving loans outside the scope of our audit. The legal code and the standard operating procedures of South Dakota government permit the establishment of relationships with business interests and the delegation of functions of government to private entities so that the government can disclaim any responsibility for any negative effects that arise. South Dakota has in effect legalized graft to evade any responsibilities for the schemes it sponsors. In most states, such evidence of corruption and collusion would incite much activity by the press to obtain information about what went on and make it public. Examples are the Chris Christie connection with the George Washington Bridge lane closures last fall. But South Dakota has, perhaps, the most feckless and bumbling press corps in the nation. Despite a few tepid editorials demanding information, such information is never forthcoming and the press backs away to keep its cozy relationship with government officials and the business community. The South Dakota press is easily cowed into submission. Then there are the bloggers. Thorough and effective investigative reporting requires the careful coordination of effort and information as a team function. Such coordination is needed to produce a comprehensive and coherent account of what is taking place. Many times investigative reports involve legal counsel who helps the reporters and editors produce a story that conforms to presentation of evidence for a legal prosecution. Bloggers tend to see their fellows as competitors, not team members engaged in a coherent pursuit of facts. However, when sound information is presented in some blogs, it is rendered useless by the comments it inspires. The many silly attitudes and ill-informed opinions expressed in comment section reduces good information to level of gossipy chatter and hard, astounding facts get flushed away in the wash. If ever the people of South Dakota are to be given an accounting of the Governor's Office of Economic Development, the South Dakota Regional Center, Northern Beef Packers, and te death of Richard Benda, it will have to at the hands of some national news agency that exists outside of the fearful climate of South Dakota. The problem is that to the national press, South Dakota is not a place of enough consequence to warrant national attention. Meanwhile, malfeasance and misfeasance are the rule in South Dakota. Many years ago, I was a newspaper farm editor. The matter of farm subsidies was a perennial problem that dominated the news coverage. During World War II, United States farmers were encouraged to ramp up production as their contribution to the war effort. They did so. The U.S. produced enough food to keep our troops well fed and to help our allies. When the war ended, farmers were still producing but the market for what they produced had shrunk as allies became more self-sufficient in producing food for their people. The crop surpluses piling up in America revived depression-era fears that farmers once again would plow their production under and leave the farms looking for other work. The stability of an economy returning to peace-time production and the security of the nation quickly sliding into a cold war required that the farm economy be kept efficient and stable. So, the government began programs of price supports and farm subsidies through which it bought agricultural surpluses. Then the problem for the government was what to do with the growing surpluses it held in storage. A partial answer was to distribute the surpluses to the poor, the hungry, the needy. Semi-trailer loads of the surpluses, initially consisting of flour, corn meal, butter, cheese, dried beans, and dry milk, would be hauled to distribution points where people who qualified could come and pick it up. As farm editor, I was provided notice of such distributions so that the newspaper could publish the times and places well in advance. And the government agents liked coverage of these events to convince the taxpayers that the products the government was buying with their money were being put to good use to keep the farm economy humming and nutrition flowing to those who needed it. Who qualified for the commodity programs was largely a matter of self-selection. Anybody who showed up and said they could use the help qualified. Of course, there were those few who obtained commodities who were not in need, but that wasn't a big concern, because the people in charge of the distribution often had rather immense quantities of left-overs. One of the workers talked me into loading up the back of my station wagon with leftovers to be distributed by my church. That led to a program in our community through which a number of denominational social service agencies cooperated in a distribution. Many people in need were too shamed and embarrassed to come to the distribution points and beg for handouts, but the social workers knew who was in need and where the food would provide much-needed nutrition. There was paper work to be done to attest to auditors that the surplus was being appropriately distributed. The main objective, however, was to give farmers a guaranteed income through price supports, soil banks, and conservation programs that attempted to balance production and demand. For the young men, that were most able and fit for labour and service, did repine that they should spend their time and strength to work for other men's wives and children without any recompense. The strong, or man of parts, had no more in division of victuals and clothes than he that was weak and not able to do a quarter the other could; this was thought injustice. The aged and graver men to be ranked and equalized in labours and victuals, clothes, etc., with the meaner and younger sort, thought it some indignity and disrespect unto them. And for men's wives to be commanded to do service for other men, as dressing their meat, washing their clothes, etc., they deemed it a kind of slavery, neither could many husbands well brook it. Upon the point all being to have alike, and all to do alike, they thought themselves in the like condition, and one as good as another; and so, if it did not cut off those relations that God hath set amongst men, yet it did at least much diminish and take off the mutual respects that should be preserved amongst them. The officers of the colony solved the problem and increased food production by allotting each family a parcel of land for which it was responsible and could receive the benefits. The incentive increased production. Conservatives cite this when they want to decry any government intervention into their lives, which they label as communism or socialism, and use it as a justification for their defamation of the poor and any programs designed to help them. They conveniently ignore Bradford's concern that the assertion of self-interest conflicted with the religious principles with which the colony was ruled: "...if it did not cut off those relations that God hath set amongst men, yet it did at least much diminish and take off the mutual respects that should be preserved amongst them." Conservatives also ignore the fact that a significant portion of American agriculture is run on a communal principle. The Amish, the Mennonites, and the Hutterites employ an economic system in which their members work for the benefit of all and, thus, maintain the values and theology of their churches as the most vital factor in their lives. Putting the welfare of all their members ahead of individual gain has made it possible for them to preserve those "mutual respects" which are essential to lives devoted to the practice of Christian principles. The farm bill that will be signed into law today is an expression of the abandonment of those mutual respects specified in the nation's founding documents to the neo-feudal establishment of a class and discrimination system. The new bill eliminates direct payments to farmers but increases the crop insurance subsidies, which insures that farmers will have, on paper at least, some commodities to sell. Ethanol and the conversion of immense amounts of farmland to corn for its manufacture put the prices of crops at levels that do not, for the time, need bolstering. Something about which there has been little discussion surrounding the farm bill is what happens if the trend toward mono-cropping corn and soybeans creates shortages of other food products, and what happens if and when wind and solar power reduces the need for other renewable fuels and farmers find themselves once again with surpluses of crops for which there is no market? The new farm bill benefits corporate and corporate-allied producers, but pays little attention to human food as a reliable and affordable commodity. The most defining aspect of the farm bill is the reduction in food stamps. While the surpluses are not a consideration in the bill, neither is the fact that a growing number of Americans cannot find jobs and the jobs they do find do not provide incomes sufficient to cover the costs of food, shelter, clothing, transportation, and healthcare. The GOP obsession with cutting food stamps shows the regressive movement back to a society with masters, in this case corporations, and serfs. And the welfare of the serfs is of no concern. They can be dismissed by defaming them as indolent and self-indulgent--despite the factual evidence that the charge is seldom true. The GOP embraces a society run as corporation, which requires that labor be cheap and submissive to any fate that corporations choose for it. And the reduction of food stamps is indicative of the contempt and disregard the GOP has for working people, and especially their children. When anyone goes hungry and ill-fed, it is a signal that there is no mutual respect and that the GOP has, as Bradford said, "cut off those relations that God hath set amongst men." The death of Philip Seymour Hoffman signals reasons why drugs and alcohol are such a treacherous threat to our culture. They take from us the supremely talented. James Lipton, who noted Hoffman's genius and contributions on Morning Joe, angrily condemned drugs. Hoffman's death occurs at a time when our attitudes and policies toward drugs are changing. Our attitudes toward alcohol, not so much. I have worked with and known people of great talent and potential who were destroyed by their addictions. Some of our greatest artists have struggled with addictions and lost. As a culture, we have never fully explored the motives. We have regarded addictions as extreme self-indulgence--which some cases may be--but we have not confronted what it is that makes highly intelligent and talented people systematically destroy themselves through addictions that take possession of their lives. My first experience with pot was as a member of a garage band. We had a tenor sax player at one point who was clearly the star of the band. He was a kid from a Mexican shanty town by the tracks where many of the houses had dirt floors. His high school (there were four public and three private high schools in the area) band teacher let him borrow records that he listened to over and over and then tried to play what he heard. He particularly liked Ben Webster, and he was learning the art of the tenor sax very well. Living where he did, there was this lovely weed growing along the tracks and in the ditches. I've since been told that the plant grew from seeds of industrial hemp that dropped out of rail cars and was not a smoking grade of cannabis, but Manny and his neighborhood friends didn't know that. So, they blew it. A lot. Most of the time when Manny played in the band, we did not know whether he'd had a toque or two, but some nights we did. Life for blacks, Latinos, and anyone else who lived in poverty or on the edge of it was a constant struggle. On some nights, Manny needed to mellow out to get in the right frame of mind to make music. On those nights, he blew what looked like cigars. That didn't bother us. But on occasion, Manny would get mellow to the point of being off rhythm and tone deaf. We used to stop the band, hustle Manny off the stand, and tell the audience that something went wrong with his instrument. It wasn't our band that Manny was playing with on those occasions. He was in a different world. One night when it happened, we had an old wire recorder along and taped Manny's performance. A few days later during a rehearsal, we played it for Manny. He said, "Holy Christ, don't ever let me do that in front of people." We didn't. I have had musicians tell me that pot did affect their playing, but not to the degree it did Manny. I don't know the explanation for it, but it made me and the other band members very wary of weed. We worked very hard to control our instruments in the most musical ways, and we feared losing control. Manny's ventures into cacophony and rhythmic failure convinced us that any kind of substance menaced our abilities to play. The stories of many of the musicians we listened to and tried to emulate being sent to prison on drug charges also made us avoid contact with drugs and alcohol. Over the years, I have seen addictions nullify the talents and opportunities for many people. Once when a group of us tried to intervene in a particularly tragic case, the people treating him said it was a choice he made. I don't think anyone would make such a choice. Lester Young (the Prez) and a host of others were in a constant struggle to keep their addictions from destroying their playing. Their art did not save them, but it was the thread they clung to in order to make some kind of contribution to humanity and its creative aspects. Their struggles are much like Philip Seymour Hoffman's. One of the things that is very clear to us now is that the punitive war on drugs did absolutely nothing to halt or alleviate drug addictions. We also know that alcohol addiction destroys the ability and talent of many and condemns them to lives of disappointment and despair. That knowledge has much to do with the legalization of marijuana and the decriminalization of it. Branding people as criminals for seeking some kind of solace or escape through over use of substances has done nothing but create a huge stigmatized class of people. As a professor, I witnessed many students get convicted for drug usage and in nearly all cases the conviction merely exacerbated whatever drove them to seek some kind of refuge in the overuse of substances. Criminalization destroyed and effectively ended many otherwise promising lives. The smarmy programs in schools to encourage kids to avoid drugs merely entice many of them to try drugs. Those programs demonstrate that educators and the authors of the programs have little understanding of the social psychology that drives children. They do not understand what creates bullying and the effects it has on children. Drugs are often the result of bullying. As for the legalization of pot, I wonder if we fully understand its potential to take possession of young minds. In the sixties, students would sometimes come class after a smoke break and were beyond communication. I saw many simply give up on class and retreat into pot and potato chips. There was something very unhealthy about it, but there was no effective way to refer them to help and convincing advice that could bring them back to productive study--in most cases. I have long been convinced that one of the factors in substance abuse is the way we regard competition and comparison. Anyone who has presided over a classroom knows that providing students with a comparative assessment of their performance in their studies is essential to their getting their personal bearings on the work they are doing. But we also know that we will lose those students who feel designated as mediocre. It is one thing to engage in competition in recreational pursuits, but it is another to make it a driving factor in education. Our stupid division of people into winners and losers is probably the biggest factor in the flagging performance in our schools. Intelligent and effective teachers know that using grades to brand students like sides of beef rather than to offer diagnostic opportunities to improve their work is destructive. When students find themselves compared unfavorably to their peers, their impulse is to disassociate themselves from their peers and identify with another cohort. Their new cohort more often than not centers itself on the use of drugs and alcohol. I will go so far to say that the most destructive force in education is that notion that education should be run like a business or an athletic program. This notion is prevalent in school boards and legislators and those who have no clue of how kids learn and what psychological environment keeps them trying and working and valuing what they do learn. The very people who decry America's competitive ranking are the very ones who created it. The most ill-informed and stupid people in our society have taken over the direction of education, which is geared more to the creation of class-rankings than to treating all kids as equal but unique. Until education is turned back to the teachers and administrators who act as team leaders, not corporate bosses, it will fail. If you live in a district where the superintendent calls him or herself a CEO, you live in an educational dud district. Some students who retreat into the drug and alcohol cultures may find ways to assert their talents and become geniuses at their chosen crafts, like Philip Seymour Hoffman. But like Philip Seymour Hoffman the scars to their souls will never fully heal and will lie in wait to destroy them. His death is a reminder of why we have to rescue our education systems and our culture from the fucked-up retards who are making America stupid.